Of course you'd like to spoil your little treasure when choosing a look for his or her room! It's totally natural, since this is the place where your youngster will sleep, read, listen to music, and invite friends over. 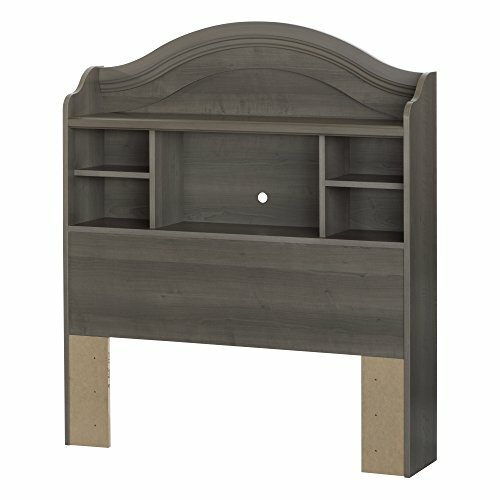 You can use this bookcase headboard to create a nice, peaceful environment with a simple yet lively décor. Can be combined with the South Shore bed from the same collection (10426). Features 5 open storage spaces, separated by fixed shelves that can support up to 10 lb. Hole in the back panel for easy wire management. Shelf #1 dimensions: 19.625'' (L) x 9.25'' (D). Shelf #2 dimensions: 9.5'' (L) x 9.25'' (D). Meets or exceeds all North American safety standards. Accessories not included. Requires complete assembly by 2 adults (tools not included). 41'' (L) x 10'' (D) x 48'' (H). Box dimensions: 47'' (L) x 13.5'' (W) x 6.5'' (H), 50 lb. Packaging tested and certified to reduce the risk of damage during shipment. Made in North America with non-toxic laminated particleboard. 5-year quality guarantee. Any questions? Contact the manufacturer, available 7/7 by phone, email or chat.